There's a lot of controversy about sharing a child's reading level. I like to think of it this way: you would never walk into an advanced tennis class before picking up a racket, right? You want to practice new skills on your skill level in a way that teaches the concepts you are working on while also challenging you to the extent that makes you feel engaged, confident and ready to try again. Learning to read is similar. My short advice: let kids explore all books, while also reading a few books on their reading level to stretch and grow their skills. Present the leveled books as a gift and a special time together rather than a punishment. My hope is that these lists help parents provide the right books for their kids so that all kids become confident readers! Hondo & Fabian by Peter McCarty. Pouch! by David Ezra Stein. Draw Me A Star by Eric Carle. A Kiss for Little Bear by Maurice Sendak. Kitten's First Full Moon by Kevin Henkes. Ten, Nine, Eight by Molly Bang. Polar Bear, Polar Bear What Do You Hear? by Bill Martin Jr, Eric Carle. For other books on a Level G/H consider the favorites by Mo Williams. The appropriate titles on this particular level include I Really Like Slop, The Big Guy Took My Ball, There Is a Bird on Your Head and Are You Ready to Play Outside? Learning to read is similar. My short advice: let kids explore all books, while also reading a few books on their reading level to stretch and grow their skills. Present the leveled books as a reward and a special time together rather than a punishment. My hope is that these lists help parents provide the right books for their kids so that all kids become confident readers! You Are (Not) Small! Boxed Set by Anna Kang. If you want to dip your toe in, try You Are (Not) Small first. If your new reader becomes interested in Pete then pair these books with nighttime read-alouds, that you read to your child. Another classic and general crowd pleaser to read after BOB books is Five Little Monkeys Jumping on the Bed. Jabari Jumps by Gaia Cornwall. Each child copes with worries in their own way. Sometimes kids feel ready and even appear overly confident but find out that feeling scared is just part of trying something new. Jabari Jumps is a relatable and straightforward story. Jabari practiced and passed his swim test but stalls when it’s time to climb to the top of the diving board. When Jabari finds the courage, the author shows how proud he feels and even excited to try more difficult tasks. Me and My Fear by Francesca Sanna. From the author of The Journey, Sanna continues the beautiful story of immigration, as a young girl settles into a new country and school. This book shows a type of courage and anxiety that not every child will experience, but each can relate to in some way. If you haven’t read The Journey to your children, I encourage you to do so. It is a beautiful and moving book about a refugee family and the sacrifices they make for safety and security. What Do You Do With a Problem? by Kobi Yamada, Illustrated by Mae Besom. From the creators of What Do You Do With an Idea? and What Do You Do With a Chance? this book is helpful for all ages. 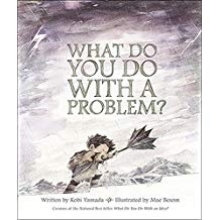 I recently read it to a group of 6th graders who were creating academic goals for the school year. The author shows how opportunities lie in every part of our lives, even the difficult ones. How Big Are Your Worries Little Bear? by Jayneen Sanders, Illustrated by Stephanie Fizer Coleman. How Big Are Your Worries Little Bear? is one that can help the child who is always thinking of the next thing on the agenda. Little Bear is a thoughtful and helpful read for parents and children and comes with discussion questions for each age group. Ruby’s Worry by Tom Percival. Ruby is, in fact, a happy child, as most kids with regular worries are. Yet when she meets her first worry, she realizes it’s hard to make it go away all on her own. Something about this book reminds me of the way that Headspace presents worries and anxieties. I’ve been using the kid’s modules in the Headspace app in my classroom. Meditation is making a huge difference in my students’ ability to focus. 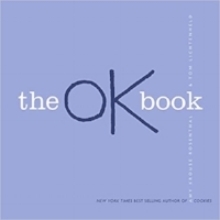 The OK Book by Amy Krouse Rosenthal, Illustrated by Tom Lichtenheld. This book provides the vital message that you don’t need to be great at everything or anything to try out a new activity. We just need to have fun trying new things! The Book of Mistakes by Corinna Luyken. The illustrations and colors in The Book of Mistakes make it a beautiful gift for both a child or an adult. If I’m being honest, I like this book more than my kids do. The author shows how an artist can turn splotches and ink splatters into beautiful works of art. The author and illustrator also recently presented an exercise in Kazoo magazine for young girls in an article, Finding Beauty in Blunders. After The Fall (How Humpty Dumpty Got Back Up Again) by Dan Santat. Ever wonder why Humpty Dumpty was sitting on the wall in the first place? He’s a bird watcher, of course! This adorable book shows what happens after Humpty’s fall and highlights the courage and resilience that is within all of our children. It’s Okay to Make Mistakes by Todd Parr. It seems Todd Parr is the Chicken Soup for the Soul messenger for children. He has a way of explaining the most relevant and complicated topics in the simplest manner that has all children nodding and agreeing. Also be sure to check out the I’M NOT SCARED Book. Sight words make up over half of all the words children are reading. I love teaching sight words in creative ways because it can be a lot of fun and helpful, but overall, any new concept we learn is most easily retained when we discover it within context. In other words, it's more meaningful when we read the word in a book rather than simply write it a few times. One easy way to do this is to utilize rich and interesting picture books that repeat sight words. Try reading these books at night for bedtime or when your child is practicing sight words. 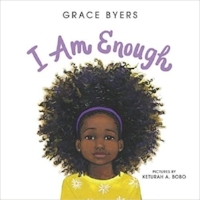 I Am Enough by Grace Byers. "Like the bird, I'm here to fly and soar high over everything. Like the trees, I'm here to grow. Like the mountains, I'm here to stand." Besides teaching the sight words, I, am and like, this book has a powerful, necessary message for all children and adults. I Want My Hat Back by Jon Klassen. This silly story is rich in sight words and repetition. A great place to start is to teach the word 'seen' before reading the book. Children can read this story over and over again to practice fluency. After reading it a few times independently, they will grasp the humor. Why Am I Me? by Paige Britt, Illustrated by Selina Alko and Sean Qualls. This picture book can provide very deep conversations with older children, and also simple but necessary teachings for younger children. The story asks the question, "Why am I me ...and not you?... Why is everyone who they are?" Examining humanity, children develop empathy for others through guided conversations. 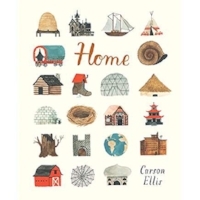 Home by Carson Ellis. The sight words home, are, and is are repeated throughout this book. It's a visually stunning book that reminds us we don't come from the same places or surroundings, yet love can make a home anywhere. It's also a great one to read when preparing your kids for a move. When's My Birthday? by Julie Fogiliano, Illustrated by Christopher Robinson. I mean, who doesn't love planning their birthday? This book is perfect for children who already have a few sight words under their belt. I'm also a sucker for all Christopher Robinson books. If your child can read short phrases, then they might enjoy When's My Birthday? Wait by Antoinette Portis. Every parent and child can relate to hectic mornings. This book tells the story of a mom who is in a hurry and a child who needs to stop to observe every single beautiful thing about their journey to school. The entire book consists of only two words, hurry and wait. Children can read it to themselves after being introduced. It would be fun to extend the reading with this sight word activity afterward. Now by Antoinette Portis. Portis really knows how to present repetition in a beautiful way. Each page in this book begins with, "This is my favorite..." The book shows a girl going about her day and experiencing each moment as her favorite. A reminder to us all to be fully present. Egg by Kevin Henkes. Egg presents words in a systematic and graphically stunning way. The author repeats words such as wait and crack over and over again on a single page so kiddos can discover the word once and then practice it. Preschool students through first graders enjoy this book. They All Saw A Cat by Brendan Wenzal. This book delivers both repetition and a socially conscious message. Teach the word saw. Read the story to your child and stop when you come to the word saw, letting your child chime in. This practice takes some pressure off and helps to build confidence. For a list of 100 sight words click here! As a working parent and a teacher, I'm often pulled in a million directions, feeling frazzled and overwhelmed. I recognize the mounting and unnecessary stress this puts on my children and me. I'm attempting to be thankful for small moments, even the ones that make me feel like I’m going crazy or running in circles. I'm not always giving thanks at 8:00 a.m. drop-off when my child dumps her lunch box out in the back seat, but I'm trying to seek out moments of gratitude with my family each day. I'm practicing modeling mindfulness and patience because, as a teacher, I see the many benefits when children are able to calm themselves and breathe in stressful moments. If you are in need of slowing down or resetting to gain perspective, check out the books below that will remind you how truly fortunate we are to be here and to know one another. 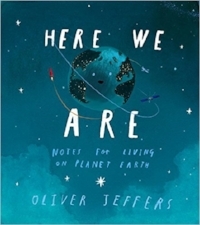 Here We Are: Notes for Living on Planet Earth by Oliver Jeffers. How we learn to grow and take in the world around us is a wonder. A book about a child's smallness in this universe, Jeffers provides some relief for parents as he points out that others will be here to take care of our children when we no longer can do so. 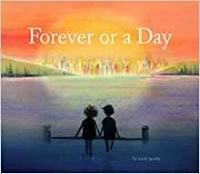 Forever or a Day by Sarah Jacoby. For any parent who is attempting to say yes more often, this book is a beautiful reminder of all the reasons we should do just that. 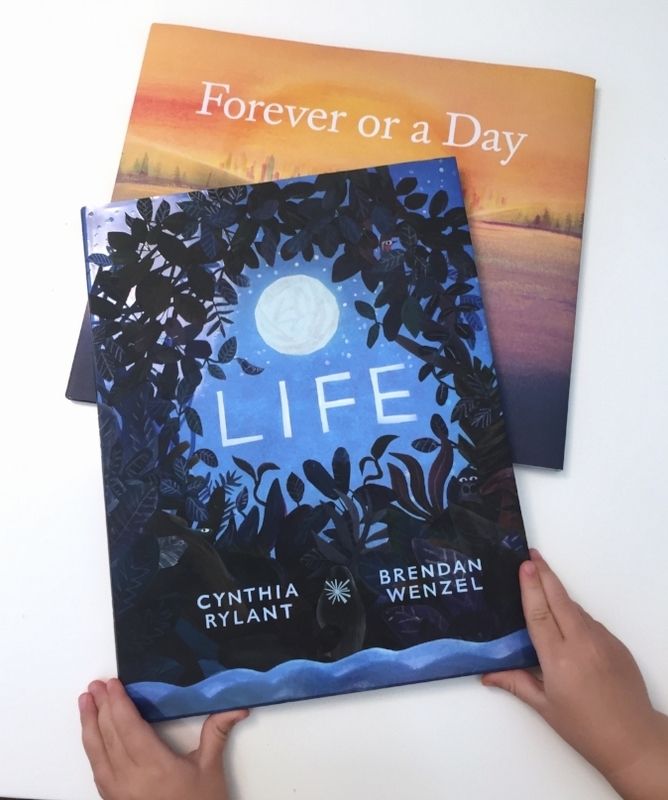 Time is the one thing we can never get more of, and in this book, a child asks if we can stay a little longer–so maybe we should. 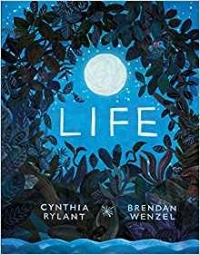 Life by Cynthia Rylant and Brendan Wenzel. Cynthia Rylant does a fantastic job of keeping complex concepts simple. Life is no exception. "Life is not always easy. There will probably be a stretch of wilderness now and then. But wilderness eventually ends. And there is always a new road to take." 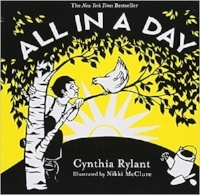 All In a Day by Cynthia Rylant and Nikki McClure. Another Rylant book because when paired with McClure’s die-cut illustrations, it’s too beautiful not to mention. “A day brings hope and kindness too…a day is all it’s own.” A sentimental reminder of how much connection we can share in a single day. Breathe and Be: A Book of Mindfulness Poems by Kate Coombs and Anna Emilia Laitinen. A Montessori teacher friend recently suggested this book. She said that she randomly grabbed it from the shelf on the last day of school when the children sit together and express their thoughts or feelings about the year. She is now using it as a yearly tradition. What a special find. "There's a quiet place in my head like an egg hidden in a nest. A place I go when the world is loud." Do you have any book suggestions or tips on being present with your children and family? I'm all ears.